Yesterday, that great sage Jake Buckler told you all that over-the-air TV is great. First of all, great job buddy! Nice of you to notice what the rest of us have been talking about for oh, 70 years. He’s right. Over-the-air TV is great. But it’s not great because you can watch tired, old reboots of glorious sitcoms and adventure shows. It’s great in spite of that. Back in April I told you TV was coming down with a case of “reboot fever.” Back in September I categorically proved that every single new show was either a reboot, retread, or just plain ripoff. And yet, the esteemed Mr. Buckler wants to tell you that he’s thrilled to death to see revamped versions of 80s and 90s TV every week. Why are there so many reboots on TV now? TV is in a bit of a rut to be sure. But even this isn’t a new thing. Retelling the same story over and over again isn’t some new invention. Do you think the story of MacBeth or Julius Caesar was unknown before Shakespeare wrote his plays? “The Bard” was just rehashing the stories he’d already heard. For twenty or so years, classic TV shows headed to the movie theater. Surely you recall the movie versions of Lost in Space, The Brady Bunch, The A-Team, The Fugitive, The Flintstones, and the mothers of all TV to movie transitions, Star Trek and Mission: Impossible. Movies have lost their luster, though. Big-budget blockbusters keep getting more costly. More and more people choose to stay home. And when they do, sometimes they just want to be brainless. Bringing back those old shows is a way of capturing a weary audience cheaply. The old actors don’t cost much and the production values are intentionally 20 years behind the norm. Not to say I don’t enjoy a good romp through Will & Grace or Fuller House now and again. I’d just say that they’re “part of a balanced breakfast” that includes new content, live programming, news and editorial stuff. So, Buckler, people shouldn’t just get antennas because they can watch Magnum PI. They should get antennas because they can also watch a lot of other worthy stuff. I’m right, and I can prove it. The ratings tell the story. Look at the Nielsen top 25 for any week this past month and you won’t find a lot of rebooted shows there. In fact new scripted shows are beating reboots by a fair margin. NBC is touting Manifest as a bona fide hit. The show’s got some interest, as people can’t decide if it’s a slow-boiler like Blacklist or a hot mess like Heroes or Lost. Either way people are tuning in to find out. Viewers also like 9-1-1 and FBI, two more shows likely to have a long run due to their familiar pattern of episodic mayhem. Looking for a reboot on that list? You’ll find The Conners tooling down around the 17-20 range in the last month. This “Roseanne without Roseanne” reboot isn’t having the same sharp impact it did last year. I’d say, people are always more interested in watching a train wreck than a train crossing, and that’s why. If you’re not watching live TV with an antenna, you really ought to be. No matter who you are, the numbers don’t lie: most people watch broadcast TV a lot. Whether it’s sports or unscripted shows or nightly sitcoms and dramas, people across the country are tuning into their local channels all the time. What’s more, you’re paying for channels that you can actually get for free! I recently read that the average cable bill has now surpassed $107 a month and if you’re just watching local channels and streaming the rest anyway, why are you paying that? Sure, satellite TV has a lot of benefits but no matter how you slice it that’s a lot of coin. 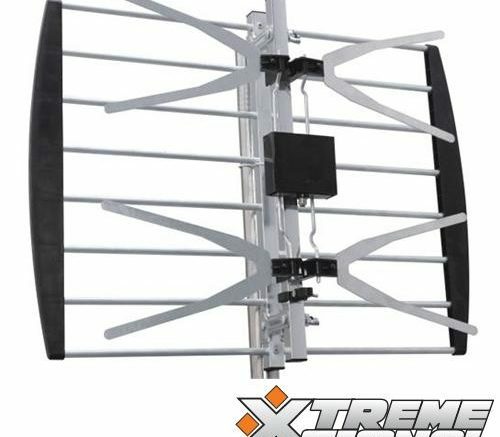 With a TV antenna you can get all the most popular shows and even stream them to your phone if you want. A TV antenna on the roof is a great investment because there’s nothing more to pay ever. It’s a great backup for when the internet goes out, it’s a great investment for when there’s an emergency or a heavy storm, and it’s just plain smart. Unlike poor Buckler, who thinks the only reason for an “aerial” (as he calls it) is to watch the oddly clean-shaven Jay Hernandez in Magnum, P.I. Buckler, you partially unraveled ball of twine, if you really love reboots so much you ought to be watching the originals. With subchannels you can. Most TV markets have a dozen or more channels of live TV you’ll never see on cable. Channels like MeTV, ThisTV, Buzzr and others concentrate on showing the original versions of these shows you incorrectly presume people are watching. That’s their real value. Don’t be like Buckler. Make a smart decision. Even if you think Jake Buckler is right, you can still be smarter than he ever was. Simply browse the great selection of antennas available at Solid Signal now. Hands on with the HD-BLADE, part 10: In a bathtub!